Really, it’s Mister the Toad, and since my entire life has been nothing but stopping to explain everything so that I never get anywhere, I guess I’ll go ahead and explain this one, too. There’s Mr. Toad from Wind in the Willows, and Mr. the Toad from Zippy. The comic strip. Zippy the Pinhead. So we called these things “Mister Toad”, because botanists have this idea that it should be called Echinocereus triglochidiatus variety triglochidiatus forma inermis. Uh huh. I feel about cactus taxonomy the same way I feel about those hard plastic boxes that hold software you buy and are never supposed to be able to use. 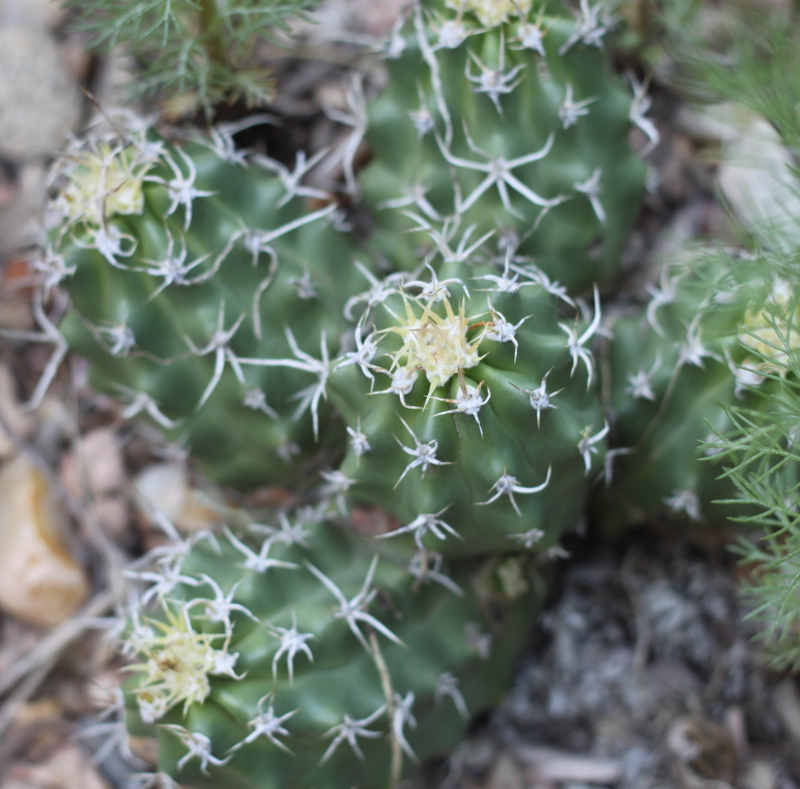 Inermis means “without spines” (not “really big”, like you might think), and these cactus people ….these cactus people….they see a couple of plants in the wild that have no spines and all of a sudden this thing is a form. It even gets on the Endangered Species list. Never mind that if you think about it for a second, all offspring of a plant are going to have a slightly different genetic code, so technically they are all forms. I think cactus people just like lots of names. 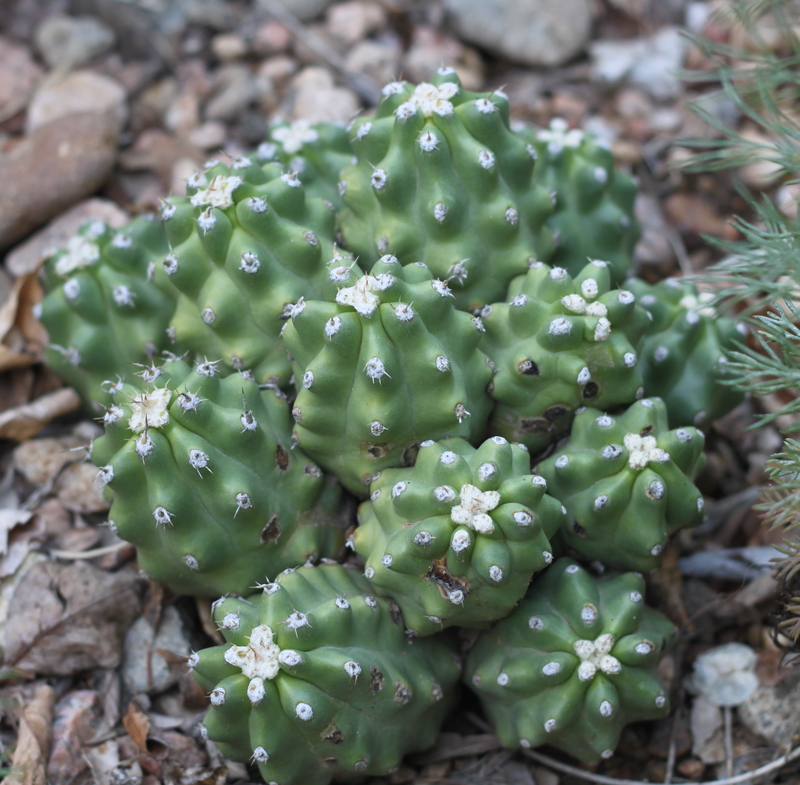 The way it got off the endangered list was that people discovered that seed from the spineless plants can produce spineless, slightly spineless, partly spineless, or even not at all spineless plants, and some people thought this wasn’t good enough for spinelessness to be recognized as a botanical entity. Kind of like a four-leaf clover. Both plants pictured here came from the same batch of seed. The plants are twenty years old. Nature seems to be a great deal more complex than humans, with their names and labels, make it out to be. This entry was posted in Uncategorized and tagged echinocereus triglochidiatus, Mr. Toad, pointless taxonomy, Zippy. Bookmark the permalink.